Native American Facts For Kids was written for young people in search of Penobscot information for school or home-schooling reports. We encourage students and teachers to visit our main Penobscot language and culture pages for in-depth information about the tribe, but here are our answers to the questions we are most often asked by children, with Penobscot pictures and links we believe are suitable for all ages. Photographs are the property of the sources we have credited. How do you pronounce "Penobscot?" What does it mean? Penobscot is pronounced Puh-NOB-scott. ("NOB" rhymes with "sob.") It comes from Panawahpskek, which means "the place where the rocks open out." This was the name of an important Penobscot village. Where do the Penobscot Indians live? How is the Penobscot tribe organized? The Penobscots live on a reservation, which is land that belongs to them and is under their control. The Penobscot Nation has its own government, laws, police, and services, just like a small country. However, the Penobscots are also US citizens and must obey American law. The leader of the tribe is called sagama in the Penobscot language, which is translated "governor" or "chief" in English. In the past the sagama was chosen by tribal councilmembers, but today he or she is elected by all the people. The Penobscots also have a representative in the Maine legislature, but she cannot vote. What language do Penobscot Indians speak? Penobscot people speak English. In the past, they spoke their native Abenaki-Penobscot language. It has this long name because two tribes, the Abenakis and the Penobscots, speak the same language with different accents--just like Americans and Canadians both speak English. Unfortunately, no Penobscot Indian people are fluent in this language anymore. However, the Penobscot Nation is dedicated to teaching young people their ancestral language again. Penobscot is a musical language with complicated verbs. If you'd like to know a few easy Penobscot words, kwai kwai is a friendly greeting and woliwoni means "thank you." You can listen to a Penobscot elder talk in her language here and see a Penobscot picture glossary here. What was Penobscot Indian culture like in the past? What is it like now? Penobscot flag Here's a brief history of the Penobscot tribe by children at the tribal school. You could also visit the tribal homepage to learn about Penobscot life in Maine today. How do Penobscot Indian children live and what did they do in the past? Penobscot toy They do the same things all children do--play with each other, go to school and help around the house. Many Penobscot children go hunting and fishing with their fathers, and some like to paddle canoes. In the past, Indian kids had more chores and less time to play, like early colonial children. But they did have toys and games like this one, corn husk dolls, and child-sized bows and arrows. Here's a Penobscot dice game which you can try playing yourself! Like many Native Americans, Penobscot mothers carried their babies in cradle-boards on their backs--a custom which many American parents have adopted now. What were Penobscot men and women's roles? Penobscot Indian men were hunters and sometimes went to war to protect their families. Penobscot women were farmers and also did most of the child care and cooking. Both genders took part in storytelling, artwork and music, and traditional medicine. In the past, Penobscot chiefs were always men, but today a woman can be chief too. What were Penobscot homes like? Penobscot wigwam The Penobscot Indians didn't live in tepees. They lived in small birchbark houses called wigwams. Here are more pictures of American Indian homes like the ones Penobscot Indians used. In the winter, each Penobscot family would leave their village to go to their own winter hunting grounds. In the springtime, all the Penobscot families returned to their villages again. Today, American Indians only build a wigwam for fun or to connect with their heritage. Most Penobscot Indian people live in modern houses and apartment buildings, just like you. What was Penobscot clothing like? Did they wear feather headdresses and face paint? Moccasins Penobscot women wore long dresses with removable sleeves, and men wore breechcloths with leggings. In colonial times, the Penobscots adapted European costume such as cloth blouses and jackets, decorating them with fancy beadwork. Penobscot Indians also wore cloaks with pointed hoods, moccasins on their feet, and nose rings. Here are more pictures of Penobscot clothing styles, and some photographs and links about traditional Indian clothes in general. The Penobscots didn't wear Indian warbonnets like the Sioux. Some Penobscot chiefs wore a tall headdress, but most Penobscots wore a pointed cap or a headband with a feather in it. They did not paint their faces. Penobscot women wore their hair loose or braided on top of their heads, and men sometimes put their long hair in topknots. Some Penobscot people today have a traditional cloak or moccasins, but they wear modern clothes like jeans instead of breechcloths... and they only wear feathers in their hair on special occasions like a dance. What did Penobscot Indians use for transportation in the days before cars? Did they paddle canoes? Penobscot canoe Yes--the Penobscot tribe was well-known for their birchbark canoes. 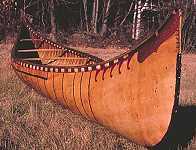 Here's a website with birchbark canoe pictures. Penobscots still enjoy canoeing, though few people handcraft a canoe from birch bark anymore. Over land, the Penobscots used dogs as pack animals. (There were no horses in North America until colonists brought them over from Europe.) The Penobscots used sleds and snowshoes to help them travel in the winter--they learned to make those tools from northern neighbors like the Cree Indians. Today, of course, Penobscot people also use cars... and non-native people also use canoes. Penobscot war club What kind of food did the Penobscot Indians eat in the days before supermarkets? They fished in the Penobscot River and hunted deer and moose. Penobscots still cherish these activities today (though most hunters use guns now instead of arrows and spears.) Penobscot Indians also planted corn and beans, picked berries, and made maple syrup from tree sap just as Maine people do today. Here is a website with more information about traditional Native American food. What kinds of weapons did the Penobscots use? Penobscot hunters and warriors used bows and arrows, spears, and heavy wooden clubs. Here is a replica of a Penobscot style double bow. Penobscot fishermen used special pronged fishing spears and nets, not fishhooks. Here is a website with pictures and information about American Indian weapons and tools. What are Penobscot arts and crafts like? Penobscot basket Penobscot Indian artists are best known for their quillwork, beadwork, and basket-weaving. Penobscot baskets were originally made from birchbark, but over the past 200 years ash splint basketry has become more popular with Penobscot artists. Here is a website of Penobscot basket photographs. Like other eastern American Indians, Penobscots also crafted wampum out of white and purple shell beads. Wampum beads were traded as a kind of currency, but they were more culturally important as an art material. The designs and pictures on wampum belts often told a story or represented a person's family. What other Native Americans did the Penobscot tribe interact with? The Penobscot traded with all the other New England Indians, and they often fought with the powerful Iroquois. But their most important neighbors were the Abenaki, Passamaquoddy, Maliseet, and Micmac tribes. These five tribes formed an alliance called the Wabanaki Confederacy. Before this alliance, the Penobscot were not always friends with these other tribes--in fact, they sometimes fought wars against each other. But once they joined the Confederacy, the Wabanaki tribes never fought each other again, and are still allies today. Click here to learn more about the Wabanaki Confederacy. What kinds of stories do the Penobscot Indians tell? There are lots of traditional Penobscot legends and fairy tales. Storytelling is very important to Penobscot Indian culture. Here's one legend about why humans need the wind. Who are some famous Penobscot Indians? Molly Molasses Louis Sockalexis, the first American Indian major league baseball player, was Penobscot. He was so strong he could throw a baseball across the Penobscot River. He had a remarkable season for the Cleveland Spiders in 1897. Unfortunately, his career was short. The fans and other ballplayers teased Sockalexis all the time because of his race. They would spit at him, call him names, and make fun of him with war whoops and tomahawk chops. This was 50 years before Jackie Robinson became the first black player in the major leagues. Sockalexis got very depressed from all the teasing and began to drink too much, destroying a promising career. The Cleveland Spiders changed their name to the Cleveland Indians after a while. Their red cartoon mascot is supposedly a tribute to Sockalexis, but it doesn't look like him. His family, and the Penobscot Nation, don't like that mascot. They think it is racist and insulting. Another famous Penobscot Indian was Molly Molasses, a 19th century medicine woman. Here's a story and a painting about her. What problems does the Penobscot tribe face today? The Penobscot River is contaminated with mercury and dioxin pollution from the logging and industrial plants of the Penobscots' white neighbors. This is a problem for everybody in Maine, but especially for the Penobscot tribe, because they rely on the river for their traditional way of life. If Penobscot people continue fishing in the river, they can become very sick. But if they stop fishing, they will lose an important part of their culture. The Penobscot tribe really wants the river to be cleaned up, but it is controlled by the state, so they are frustrated. Here is a newspaper article about that. Religions are too complicated and culturally sensitive to describe appropriately in only a few sentences, and we strongly want to avoid misleading anybody. You can read this interesting article about the intertwining of native traditions with Catholicism among the Penobscots, or you can visit this site about Native American religions in general. You may enjoy Crossing the Starlight Bridge by Alice Mead. It's a novel about a contemporary nine-year-old Penobscot girl struggling to maintain her culture after her parents' divorce forces her to leave the reservation. If you prefer historical fiction, Arrow Over The Door is a good book about the lives of two white and Indian boys in New England during the 1700's and the friendship their families forge. Two good biographies of Penobscot ballplayer Louis Sockalexis are Louis Sockalexis, Baseball Pioneer and Baseball's First Indian. If you are looking for historical information for school, Twelve Thousand Years is a good reference book about Native American people in Maine in general. Younger children may like Raccoon's Last Race, a lively picture book telling a traditional Wabanaki story. You can also browse through our reading list of Native American literature. Thanks for your interest in the Penobscot people and their language! An overview of the Penobscot people, their language and history. Penobscot language samples, articles, and indexed links. Related links about the Penobscot people past and present.